Welcome to my stop on this special blog hop! I'm so glad you're here! If you've arrived from the amazingly talented Erum's blog, you're in the right place. If you want to start at the beginning of the hop, head over to Altenew's blog here. 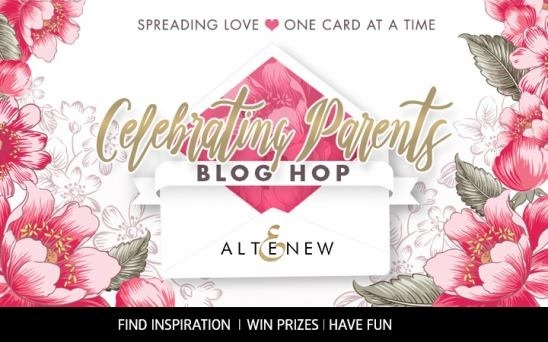 Altenew is celebrating parents, not only with this hop, but also with a very important card drive. Their goal is to send cards to the elderly who live in nursing homes and shelters, to let them know they're not forgotten. 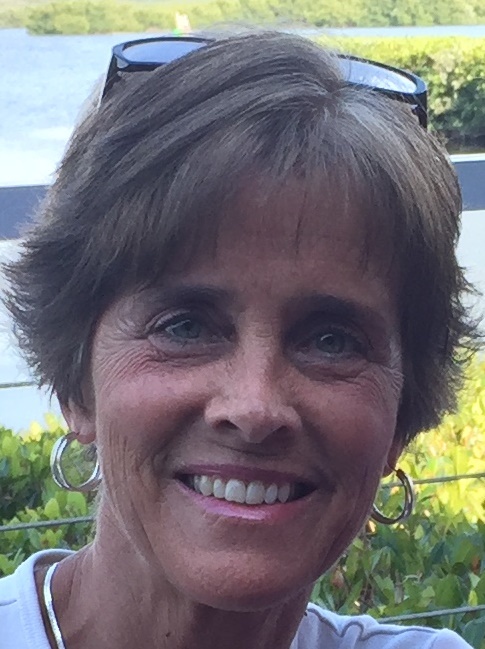 We want these important people to feel loved, celebrated and honored and we need your help! PLEASE check out the, "Celebrating Parents Blog Hop" page here to read more about this important cause and to see the details of how you can participate. Did you know that Altenew has wonderful stamp sets that celebrate parents? With Mother's Day and Father's Day coming soon, their perfect for those important cards we all need to create! 20% of the the profits earned from the above three stamp sets, by 6/18/2017, will be donated to the Food Bank of Central New York to support seniors in need. 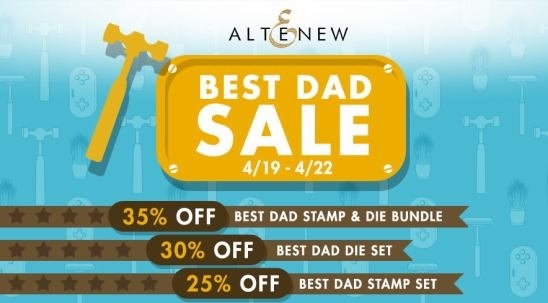 Altenew also is having a sale on their Best Dad stamp set and dies, through April 22nd. No coupon code needed. How awesome is that? 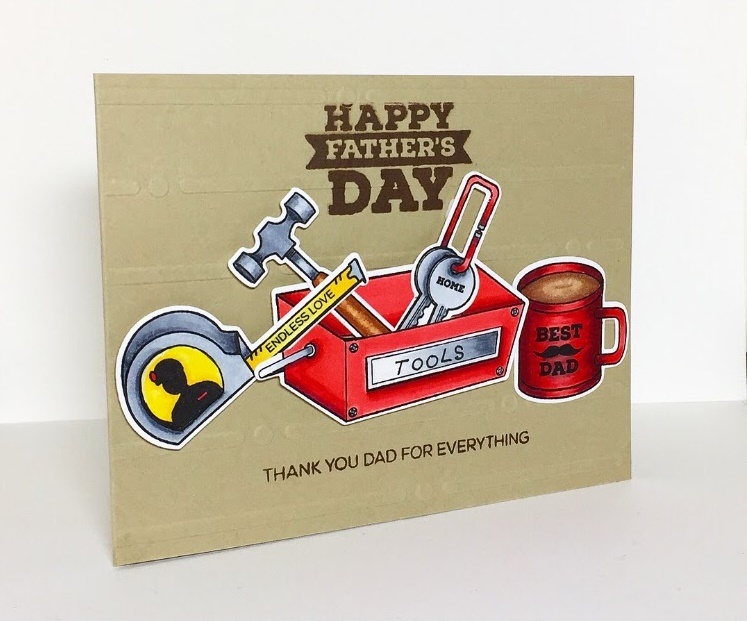 It is seriously the cutest set, with so many fun images you can use to create amazing Father's day cards! Altenew is giving away $50.00 gift certificates to three lucky winners! Be sure to leave comments by Sunday April 30, 2017, 11:59PM EDT for a chance to win. Winners will be chosen at random and will be announced on the Altenew blog on May 2nd. Altenew is also allowing me to randomly select a winner for a $30.00 gift certificate to their store! Comment by the date above and I will announce that winner on May 1st, here on my blog! Whew! I know that was a lot of info but this blog hop supports such a good cause! Okay, let's get to the cards I created for your inspiration. 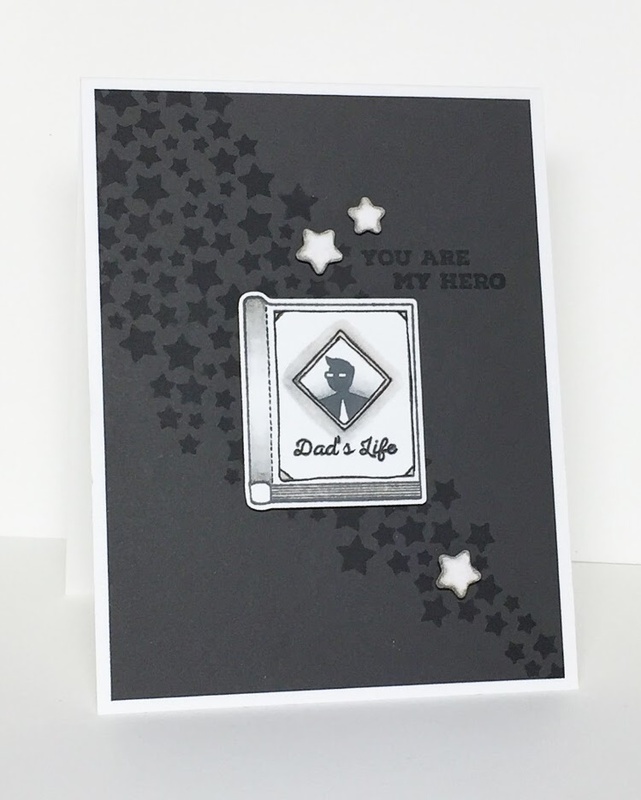 First up is a couple of cards using the Best Dad stamp and die set. I've linked all supplies at the end of this post. Compensated affiliate links used. I loved coloring and die-cutting all these adorable images! I cut a slit in the box so I could slip in the images of the hammer and keys. I also wrote the word, TOOLS on the front of the box. For this card I stamped the stars in the same color ink as the cardstock panel, then die-cut the book image and popped it up onto the panel. 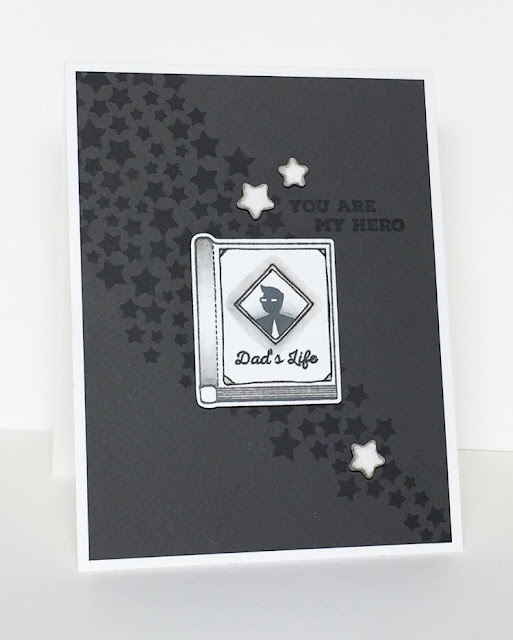 A few more die-cut stars, and the sentiment, finish off this simple but manly card. For my next card, I used the beautiful, Penned Rose set. Colored with Copics to create a white rose for mom, or for any special person in your life. My last three cards were created using the Best Mom stamp set. For each one, I used the same image and same sentiment. But, I wanted to try three different techniques for coloring this pretty image. The first one is stamped in black and colored with Copics, which are my favorite medium to use. This next one uses Copics again but this time I did no-line coloring. GASP! It was the first time I've ever really tried it and I still need lots of practice! It is NOT an easy technique, that's for sure but I enjoyed the process! For my last card, I white embossed the image on watercolor cardstock and used Zig Markers for my medium. It created a softer look, which I think is so pretty! Wonderful Father's and Mother's Day cards! And I think you did a fabulous job on your no line coloring! They are gorgeous! Great cards for such special people in your life . Awesome. Thanks for sharing. Wonderful cards. Your coloring is beautiful. Love the clean and crisp look of your cards. They're just stunning! LOve your wonderful cards, Barb!!! What a nice group of cards. The are all so nice and would be a joy to receive any one of them. We all appreciate you time and willingness to share your work. Stunning cards, Barb! Your Copic coloring is amazing...especially your blooms with no line coloring...I'm so impressed! So happy to see you on the hop today!!! Great card design's, especially like the second an third flower card! All your cards are fantastic! Thank you for sharing. Wonderful cards! Your no line watercolor is beautiful. Great job. Each of your cards are spectacular. Love it a lot. Awesome cards! Love the best mom cards - you did a fantastic job coloring them! All the cards are so pretty. Loving the floral cards in this set. Love these pretty and clean and simple cards!! Your coloring skills are awesome, love the added dimension with the shadows too. Thanks so much for sharing! Your cards are simply beautiful. Thanks for the inspiration. Those floral cards are beautiful. I think I like no line embossinf. Your florals are absolutely gorgeous! Lovely Mom cards but it is the Dad cards that I just love. This is a fabulous set and the whole blog hop has had one great card after another. That red is so enticing. I am in love with your last card. It is so lovely. Love them all Barb., amazing lovely cards. Lovely card ideas -especially for the difficult MAN cards! Love your cards. You did beautiful coloring. Gorgeous cards! I love each one of them! Wow Barb all your cards are so gorgeous. I especially love the 'white' floral card and your use of copics is beautiful!!! Fantastic cards. I especially enjoyed the flowers and the different mediums. Each card is uniquely beautiful. Thanks for sharing your artistic talents. I love your header on your blog. So pretty and colorful. Love it. A great collection of cards. Love your red tool box. You did a great job with the no-line coloring - hard to believe it was your first time, beautiful. Beautiful cards, Barb! Your coloring is exquisite. I love them all. 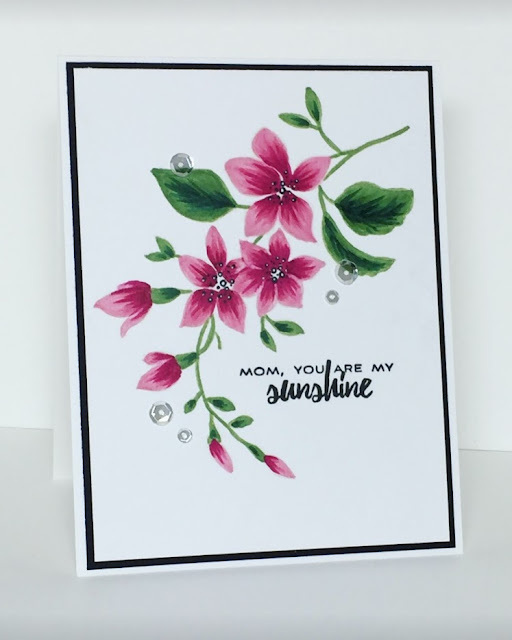 I loved the three different ways you used the Mother's Day stamp set. Each one is beautiful in its own way. These are great cards--I like them all. They each inspire me with a different idea. Thanks for sharing them. Lovely cards, love your coloring. As for the no line, I have yet to try it. But yours looks good!! I love how you how used the same design and created 3 different looks. They turned out beautiful. 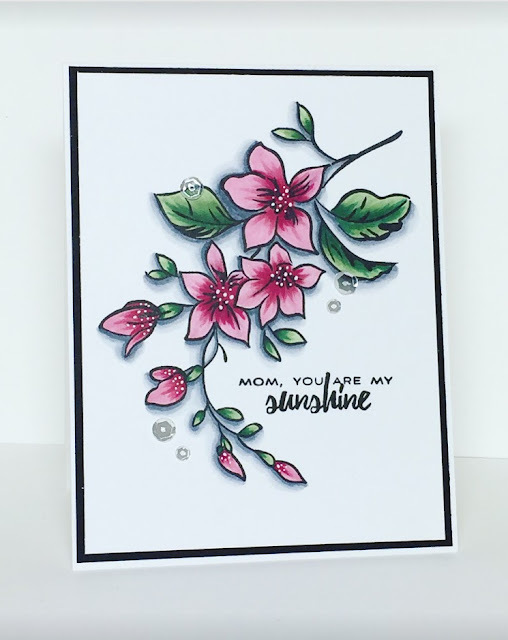 LOVED seeing the versatility of the Best Mom stamp set with your coloring mediums/styles! Love all of your cards Barb. A very busy lady but it was time well spent! fabulous cards Barb! love them all, thanks for the inspiration! I love the variety of floral cards! Wow you have been busy, what an awesome collection of cards. I love how you used the different colouring techniques on the same design. It's amazing how different the same design can look. Amazing talent! like the shadows around your flowers. I love that you showed three different mediums on the flower cards. I personally have not tried the no line coloring, but you did a fantastic job, and have inspired me to try it. All of your cards are fabulous! Love all your cards. I especially like the florals as you used different mediums to get several different looks. Very nice! Gorgeous cards Barb especially those beautiful flower ones. Lots of great cards you created. My favorite one is the first with the tool box. Beautiful cards, all of them. 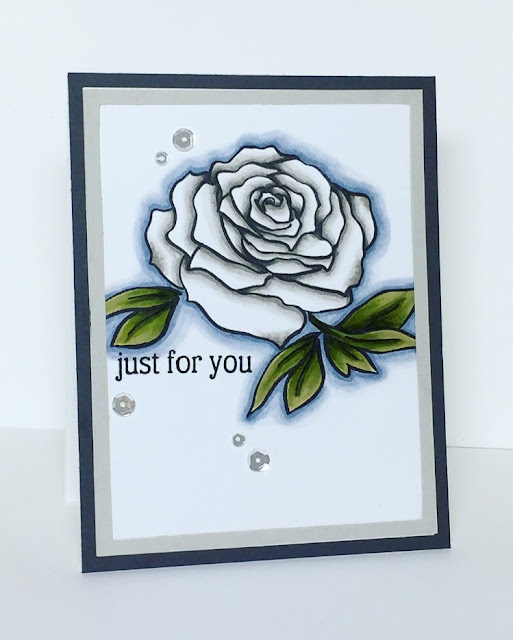 Love the tone on tone stars on the one card though - great idea for some subtle shine and embellishment! Wow, so many great cards! Love the "You are my hero" card. These are all fabulous!! I think my favorite is the last one with the no-line coloring; it turned out so beautiful! I love those floral cards - each a little different from the next but each also very very lovely!! The cards are all awesome! Your no-line coloring is really pretty! My favorite! All your cards are amazing but I especially love the Dads day one because cards for men are the toughest for me to make. So many fun options! Nice job on all of your cards. Wow beautiful creations! Thanks for the inspiration! Beautiful cards!I love the white rose one! Wow, looks like you were inspired! Thanks for inspiring us in return! Great job on the no-line colouring. I think this card is my favourite. Love your cards. Thanks for sharing your fabulous ideas. Absolutely beautiful cards. Love the three ways to color examples. Thanks for the inspiration! All of your cards are awesome but my absolute favorites are "Dads life" and your breathtaking white 🌹! WOW WOW WOW WOW WOW! Totally in love with that one! TFS! Barb, these are fantastic! Each design is so stunning and unique too. All the cards are really beautiful. Love the colors and the different styles. Your cards are great, it is amazing how different Mom cards with the same stamp are when a different technique is used on each. I love your no-line coloring and so many of Altenew's images are just stunning when colored with any medium --- but I'm especially partial to white embossing with the zigs. Just gorgeous! Wonderful cards. So many wonderful ways to use the stamps. Awesome cards! I love the Best Mom stamp set! Such fabulous cards! Thanks for showing us the 3 different colouring results - all so beautiful! Wonderful! Each and every one of them! Truly anyone would love to receive these cards. Thank you for showing the three different ways to color your last image. Great stamps, great creativity. I love the white rose card! Stunning!! The other Mom cards are stunning, but the rose is my favorite. So pretty!! Barb very beautiful! My fav is first card....stunning! Thanks for sharing this beautiful set of cards, Barb. I really like the great colour scheme of your first "Dad" card, and the beautiful colouring and elegant simplicity of your various Mother's Day cards. Terrific cards! You shared so many techniques and great ideas. Fabulous use of the products. LOVE them ALL, especially your 2nd card (Dad's Life) and last card (soft watercolour)! Nice cards! I especially like the dad card you colored. SO many beautiful cards! Love the elegant b&w's! Love the simplicity and impact of the father's day cards and the beautiful coloring on the florals! simple and nice, loved it. Love the simplicity to the masculine cards - Any guy would love them! 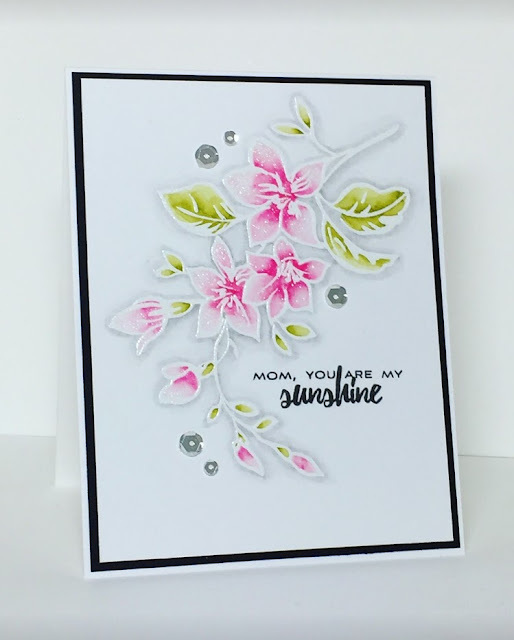 The floral cards are gorgeous - It is so cool the way the different techniques make each card so different! All of the cars are wonderful. You did a fabulous job on all your coloring. Beautiful cards, love your rose card! Really nice cards. You did an awesome job with the no line coloring, would never have known it was your first time had you not told us. Love the colors and techniques used. The Father's Day cards are nice. All Mother's Day cards are very pretty. Barb, what fun Father's Day cards & beautiful flower cards. Your coloring is simply fabulous. Lovely lovely cards, I really likes your coloring techniques, wouldn't know you were new to it. Thanks for sharing!